Amazing. But strangely coughy. I have never heard so many coughs during a concert before. My first two Viennese concert experiences took place at the Wiener Konzerthaus, though in different performance rooms. I saw the Jussen brothers (young pianists who play four-hand repertoire together) in the Schubert-Saal. I’m a longtime fan of the Jussen brothers, so seeing them in person for the first time was a bit surreal. They opened with Schubert's F-minor Fantasie, which, cliché as it sounds, gave me chills. They followed this with a brotherly jam session to the Poulenc Sonata for four hands (and when I say jam session, I mean jam session—head bouncing included) and a performance of a contemporary piece called “Night” by Fazil Say that involved sound effects under the piano lid. I don't know how it’s possible, but the Jussen brothers exceeded my expectations! They have a lot of charisma and relatability that younger music-lovers like myself can appreciate. But when it comes to connecting with their listeners, age doesn’t actually matter, as they definitely won over the entire gray-haired audience. “Talentueux!” I heard a French woman say on the way out. I totally agree! 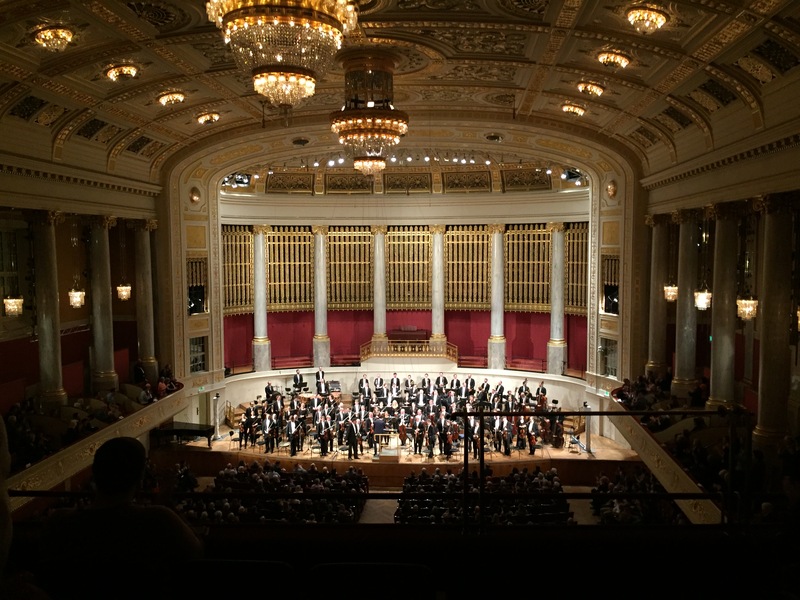 The second concert I attended was Yuja Wang and the Wiener Symphoniker in the main concert hall, the Groß-Saal. I was pretty much starstruck when Yuja walked out of the stage door. It’s crazy to see people you admire in person! For this concert, my view was obstructed by a woman in front of me with very, very poofy hair. When she tilted her head to the right on a couple of occasions, I managed a few glorious glances of Yuja Wang in her glittery silver dress absolutely owning the piano. She performed the Schumann *COUGH* A-minor *COUGH* concerto (I add the coughing sound effects to best portray the eruption of coughs between each movement). In response to the audience's non-stop applause, she delivered two sparkling encores! Needless to say, I am SHOOK by the amazingness of those first two concerts, and this is only the beginning! The abundance of good music in Vienna is filling me with enthusiasm for my own music studies. With all the time and dedication music requires, my motivation sometimes dwindles. 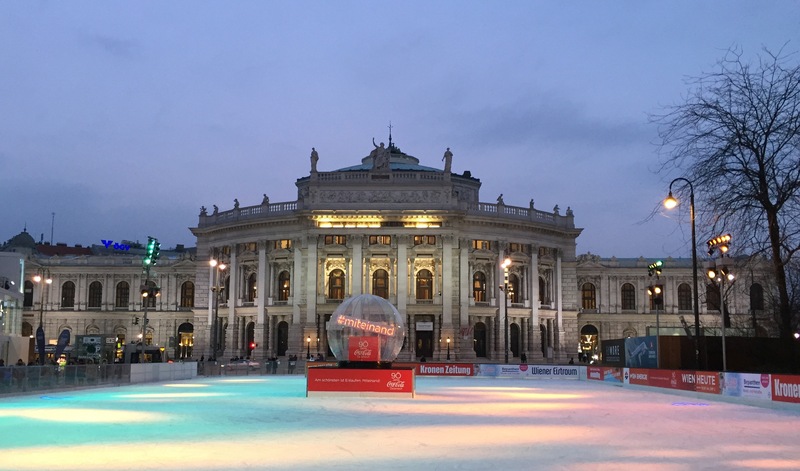 In Vienna, I don't think that is possible—not with all of this music going on around me! Besides the concerts, I mentioned the architecture, the food, and the language, so let me quickly talk about that. 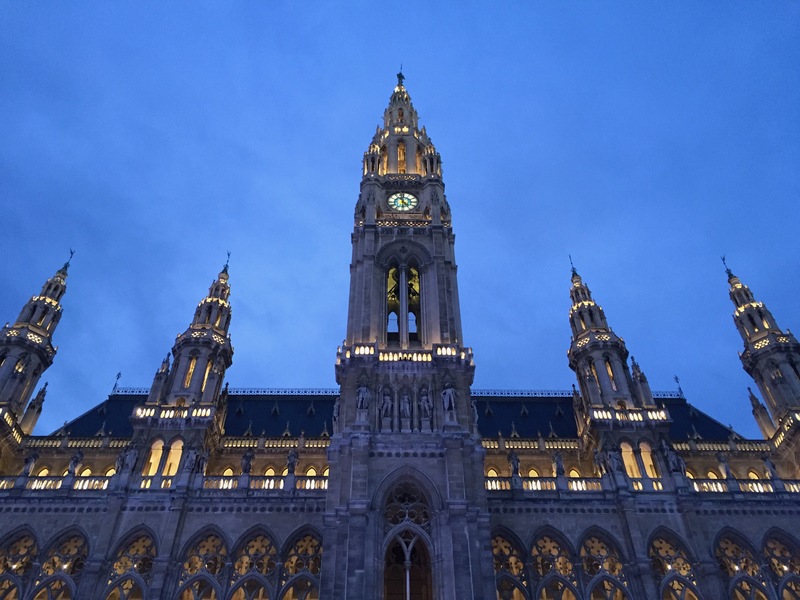 The architecture: I have been enjoying the palacelike buildings—you don't see these kinds of buildings in the U.S. One of my favorite buildings is the Rathausplatz building across from the Burgtheater. Between these two buildings, there is a network of skating rinks that wind through lit-up trees. Skating there feels like a fairy tale come to life! The food: I love the café culture, the not-too-sweet hot chocolate, and the Kasekrainers (hot dogs with cheese). I’m still struggling with grocery shopping and cooking for myself… my favorite no-cook meal is plain yogurt with chocolate muesli. Language: I still am far from conversationally proficient in German, but these past two weeks of German intensive have helped me improve a lot in a short amount of time. I am starting to understand what I am hearing in everyday life, such as bits and pieces of conversations of people on the subway. I especially enjoy being able to order something without the waiter having to switch to English. As you can see, a lot has already happened since I have arrived in Vienna. I'm excited for what is to come! Thanks for reading my blog, stay tuned, and tschüss (I can actually sign off in German now)!